Materials scientists have sussed out the physical phenomenon underlying the promising electrical properties of a class of materials called superionic crystals. A better understanding of such materials could lead to safer and more efficient rechargeable batteries than the current standard-bearer of lithium ion. Becoming a popular topic of study only within the past five years, superionic crystals are a cross between a liquid and a solid. While some of their molecular components retain a rigid crystalline structure, others become liquid-like above a certain temperature, and are able to flow through the solid scaffold. 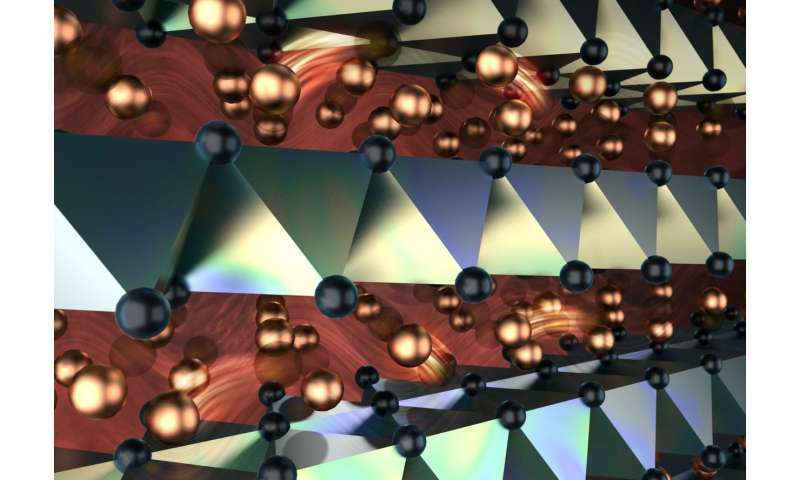 In a new study, scientists from Duke University, Oak Ridge National Laboratory (ORNL) and Argonne National Laboratory (ANL) probed one such superionic crystal containing copper, chromium and selenium (CuCrSe2) with neutrons and X-rays to determine how the material's copper ions achieve their liquid-like properties. The results appear online on Oct. 8 in the journal Nature Physics. "When CuCrSe2 is heated above 190 degrees Fahrenheit, its copper ions fly around inside the layers of chromium and selenium about as fast as liquid water molecules move," said Olivier Delaire, associate professor of mechanical engineering and materials science at Duke and senior author on the study. "And yet, it's still a solid that you could hold in your hand. We wanted to understand the molecular physics behind this phenomenon." To probe the copper ions' behavior, Delaire and his colleagues turned to two world-class facilities: the Spallation Neutron Source at Oak Ridge and the Advanced Photon Source at Argonne. Each machine provided a unique piece of the puzzle. By pinging a large sample of powdered CuCrSe2 made at Oak Ridge with powerful neutrons, the researchers got a wide-scale view of the material's atomic structure and dynamics, revealing both the vibrations of the stiff scaffold of chromium and selenium atoms as well as the random jumps of copper ions within. With both sets of information in hand, Delaire's group ran quantum simulations of the material's atomic behavior at the National Energy Research Scientific Computing Center to explain their findings. Below the phase transition temperature of 190 degrees Fahrenheit, the copper atoms vibrate around isolated sites, trapped in pockets of the material's scaffold structure. But above that temperature, they are able to hop randomly between multiple available sites. This allows the copper ions to flow throughout the otherwise solid crystal. "Most commercial lithium ion batteries use a liquid electrolyte to transfer ions between the positive and negative terminals of the battery," Delaire said. "While efficient, this liquid can be dangerously flammable, as many laptop and smartphone owners have unfortunately discovered." "There are variants of superionic crystals that contain ions like lithium or sodium that behave like the copper in CuCrSe2," Delaire said. "If we can understand how superionic crystals work through this study and future research, we could perhaps find a better, solid solution for transporting ions in rechargeable batteries."